Students create a haunted house blueprint using graph paper. After designing their haunted house, students create a point of view narrative that takes a character through their entire haunted house. 1. Use attendance data from the previous 10 years to create a line graph. 2. Read customer reviews from last year's haunted house. 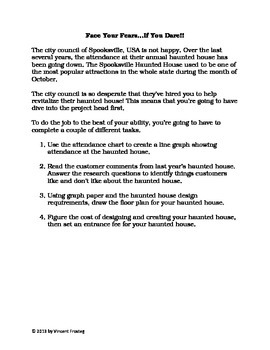 Use this information to help you design your haunted house. 3. Create a floor plan using design guidelines. Create a theme for each room and describe the characteristics of it. 4. 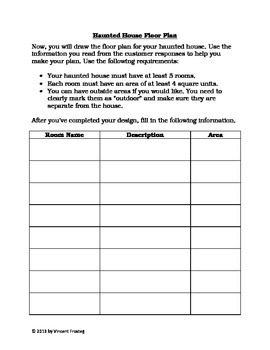 Figure the total area of the haunted house and multiply to figure the cost of design and creating. 5. Create a point of view narrative. John is a character who is walking through the haunted house. Students describe what he will see, hear, and experience as he does. 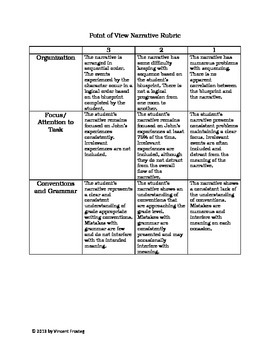 Rubric included.